Massive and thick-coated, bison were once the icons of North America’s Great Plains. They are the largest land animals on the continent. They were also once the most abundant, with an estimated 30 to 60 million before European settlement. Bison eat mainly grasses and sedges—roughly 15 pounds per animal per day. Bison roam wide-open prairies. The animals also inhabited savannas and forests in their heyday. The bison and the prairie benefit from each other, with the plants providing food for bison, and the bison’s grazing, trampling, and defecating helping keep the prairie ecosystem healthy. Bison spend their mornings eating and their afternoons chewing cud. Their thick fur helps these animals survive the bone-chilling cold of prairie winters. Bison were hunted to near oblivion in the 1800s, with the population of plains bison down to less than 600 before protective measures were put into place. Today, with 30,000 animals in conservation herds and thousands more on farms, the bison is considered a conservation success story. Bison grunt periodically to communicate and keep contact with the rest of the herd. They bellow aggressively when challenging another animal. 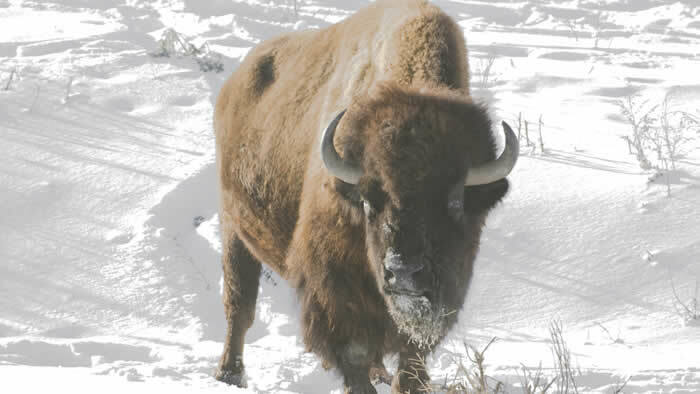 In winter bison clear snow from their grazing area by sweeping their massive heads from side to side. Wolves and grizzly bears are natural predators of bison. Today bison are raised in herds to provide low-cholesterol meat. Bison are a conservation success story. They were hunted to near extinction in the early 1800s, but brought back to healthy numbers through protection and captive management. 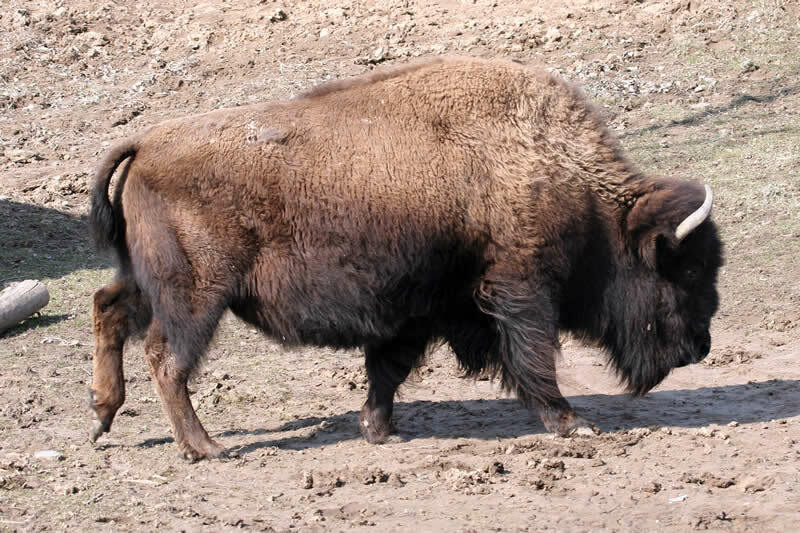 Individuals and groups such as the American Bison Society continued to breed bison with the purpose of reintroducing them to their natural range. In the early twentieth century, one of the first reintroduction of animals from zoos back into the wild was a herd of bison sent to Oklahoma from the New York Zoological Park, now known as the Bronx Zoo. The Minnesota Zoo is working with the Minnesota Department of Natural Resources (DNR) to conserve the American plains bison genome by managing a herd of bison that have tested free of cattle genes. This makes them very special, and important for conservation. Most bison herds have small amounts of cattle genes due to past interbreeding with domestic cattle. We are also working with the DNR to return bison to some of Minnesota’s state parks. Minnesota Zoo staff coordinates the genetic testing and pedigree tracking of the bison herd. 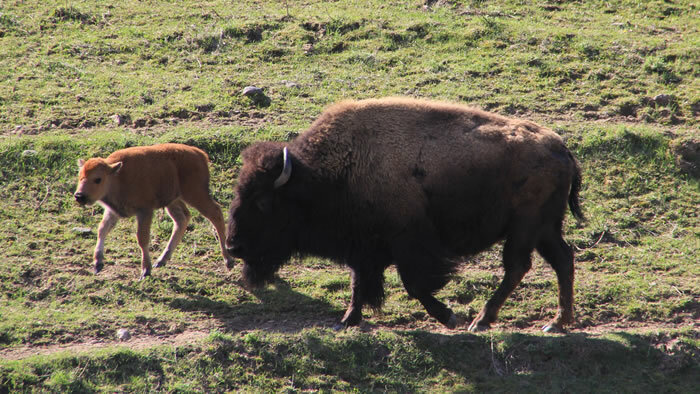 All bison calves born at the zoo are released into a Minnesota state park at the yearling age. Learn more about what the Zoo is doing.